Attention is given to fundamental concepts and techniques, their practical applications and the future scope of developments. Several topics, essayed as individual chapters include reconfigurable antenna, ultra-wideband (UWB) antenna, reflectarrays, antennas for RFID systems and also those for body area networks. Also included are antennas using metamaterials and defected ground structures (DGSs). Essential aspects including advanced design, analysis and optimization techniques based on the recent developments have also been addressed. Discusses modern applications such as wireless base station to mobile handset, satellite earth station to airborne communication systems, radio frequency identification (RFID) to body area networks, etc. This book provides a reference for R&D researchers, professors, practicing engineers, and scientists working in these fields. 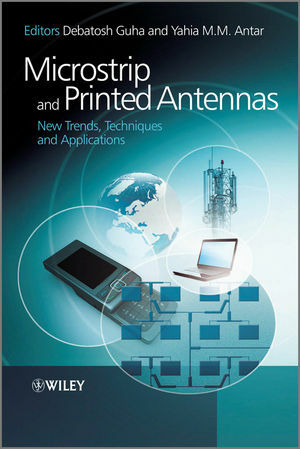 Graduate students studying/working on related subjects will find this book as a comprehensive literature for understanding the present and future trends in microstrip and printed antennas. Debatosh Guha is Professor in Radio Physics and Electronics of the University of Calcutta, India. He has been active in research and teaching at post-graduate level in the areas of microwaves and antennas for last 18 years. He has published more than 100 Journal and Conference articles and has developed CAD for various microstrip antennas, which were reported in IEEE and IEE Journals. He has also developed some high gain microstrip antennas for a North American Wireless Industry, which have been implemented as commercial products. Yahia M. M. Antar is Professor of ECE Department of the Royal Military College of Canada in Kingston, Ontario. He has authored or co-authored over 150 journal papers, holds several patents, chaired conferences and sessions in many conferences, and supervised or co-supervised over 60 Ph.D. and M.Sc. theses at the Royal Military College and at Queen's University, of which several have received the Governor General of Canada Gold Medal as well as best paper awards in major symposia. He served as the Chairman of the Canadian National Commission for Radio Science (CNC, URSI,1999-2008), holds adjunct appointment at the University of Manitoba, and, has a cross appointment at Queen's University in Kingston. 1 Numerical Analysis Techniques (Ramesh Garg). 1.2 Standard (Yee’s) FDTD Method. 1.3 Numerical Dispersion of FDTD Algorithms and Hybrid Schemes. 1.7 Robustness of Printed Patch Antennas. 1.9 Modeling of PEC and PMC for Irregular Geometries. 2 Computer Aided Design of Microstrip Antennas (Debatosh Guha and Jawad Y. Siddiqui). 2.2 Microstrip Patch as Cavity Resonator. 2.3 Resonant Frequency of Circular Microstrip Patch (CMP). 2.4 Resonant Frequency of Rectangular Microstrip Patch (RMP) with Variable Air Gap. 2.5 Resonant Frequency of an Equilateral Triangular Microstrip Patch (ETMP) with Variable Air Gap. 2.6 Input Impedance of a Microstrip Patch. 2.7 Feed Reactance of a Probe-Fed Microstrip Patch. 3 Generalized Scattering Matrix Approach for Multilayer Patch Arrays (Arun K. Bhattacharyya). 3.2 Outline of the GSM Approach. 3.4 Finite Array: Active Impedance and Radiation Patterns. 4 Optimization Techniques for Planner Antennas (Rabindra K. Mishra). 4.3 Real Coded Genetic Algorithm (RCGA). 4.4 Neurospectral Design of Rectangular Patch Antenna. 4.5 Inset-fed Patch Antenna Design Using Particle Swarm Optimization. 5 Microstrip Reflectarray Antennas (Jafar Shaker and Reza Chaharmir). 5.2 General Review of Reflectarrays: Mathematical Formulation and General Trends. 5.3 Comparison of Reflectarray and Conventional Parabolic Reflector. 5.4 Cell Elements and Specific Applications: A General Survey. 5.5 Wideband Techniques for Reflectarrays. 5.6 Development of Novel Loop-Based Cell Elements. 6 Reconfigurable Microstrip Antennas (Jennifer T. Bernhard). 6.2 Substrate Modification for Reconfigurability. 6.3 Conductor Modification for Reconfigurability. 6.4 Enabling Reconfigurability: Considerations for Reconfiguration Mechanisms. 6.5 Future Trends in Reconfigurable Microstrip Antenna Research and Development. 7 Wearable Antennas for Body Area Networks (Peter S. Hall and Yang Hao). 7.2 Sources on the Human Body. 8 Printed Antennas for Wireless Communications (Satish K. Sharma and Lotfollah Shafai). 8.2 Broadband Microstrip Patch Antennas. 8.3 Patch Antennas for Multiband Wireless Communications. 8.4 Enhanced Gain Patch Antennas. 8.5 Wideband Compact Patch Antennas. 8.7 Microstrip Planar Monopole Antenna. 9 UHF Passive RFID Tag Antennas (Daniel Deavours and Daniel Dobkin). 10 Printed UWB Antennas (Zhi Ning Chen, Xianming Qing and Shie Ping See). 10.2 “Swan” Antenna with Reduced Ground Plane Effect. 10.5 Printed Slot UWB Antenna and Band-Notched Solutions. 11 Metamaterial Antennas and Radiative Systems (Christophe Caloz). 12 Defected Ground Structure for Microstrip Antennas (Debatosh Guha, Sujoy Biswas, and Yahia M. M. Antar). 12.3 DGS for controlling Microstrip Antenna Feeds and Front-End Characteristics. 12.4 DGS to Control/Improve Radiation Properties of Microstrip Patch Antennas. 12.5 DGS for Reduced Mutual Coupling between Microstrip Array Elements and Associated Improvements. Appendix: A Brief DGS Chronology. 13 Printed Leaky Wave Antennas (Samir F. Mahmoud and Yahia M. M. Antar). 13.2 The Leaky Wave as a Complex Plane Wave. 13.3 Radiation Pattern of a Leaky Wave. 13.4 Examples of Leaky Mode Supporting Structures. 13.7 Further Advances on a Class of Periodic Leaky Wave Antennas. Appendix I Preliminary Ideas: PTFE-Based Microwave Lamiantes and Making Prototypes. Appendix II Preliminary Ideas: Microwave Connectors for Printed Circuits and Antennas.